The lead designer of The Elder Scrolls III and IV, a New York Times bestselling fantasy author, and one of comics' most notable creators walk into a development studio to create an action role-playing game based on an entirely original fantasy world. Stop me if you've heard this one. Former major league baseball pitcher Curt Schilling assembled the dream team of RPG designer Ken Rolston, author R.A. Salvatore, and Spawn's Todd McFarlane to breathe life into his new fantasy world. Now that dream team is finally up at bat, swinging for the far fences with Kingdoms of Amalur: Reckoning. The game begins with the main character awakening after a long period of not being alive. Their mind wiped clean by the trauma of resurrection they venture out into the world as a clean slate, discovering this strange new world and bringing the player along for the ride. World-threatening events occur. Levels are gained. Equipment is earned. The forces of evil are in for a bumpy ride. With a triple play of a pedigree powering the endeavor, it could be one of the finest action role-playing games ever created, or it could be a complete mess. Let's find out together. Massively Single-Player: 38 Studios originally began developing Kingdoms of Amalur: Reckoning as a massively multiplayer online role-playing game akin to World of Warcraft or EverQuest. When the company acquired Big Huge Games in 2009 the project was transformed into a single-player action RPG (an MMO is still in the works), but the foundation of a much larger game world remains intact. The game's five sprawling regions are packed with random enemy encounters, quest-bestowing non-player characters, bustling cities, tiny hamlets, and untold treasures just waiting for an adventurer to stumble across them. Reportedly it took developers armed with intimate knowledge of the game's mechanics and secrets more than 200 hours to complete every quest in the game during testing. It took me nearly 25 hours to complete the main quest alone. Judging by the number of quest available exclamation points I passed up during my play trough, I'd say that's a safe estimate. As a reviewer tasked with completing the core story in a set amount of time, the massive scope of Reckoning nearly had me in tears, the action role-playing fanatic inside me hopping up and down excitedly all the while. WHY: It's an extremely well-crafted action role-playing experience with all the bells and whistles fans of the genre crave and countless hours of quality hack-and-slash entertainment in a fully-realized new fantasy world. Type of game: Action role-playing on an epic scale. What I played: Cleared the main quest line in 25 hours on normal difficulty, spent an additional 5-10 hours playing through side quests, fooling about with crafting, and mixing up my character build. More content than any single-player game deserves. Who are these people, and why should I care? Spinning Yarns: Powered by the pen of fantasy author R.A. Salvatore, Kingdoms of Amalur: Reckoning weaves together countless stories into a rich and compelling history. The core adventure introduces us to a world in the thrall of fate, its denizens content to be swept up in the currents of destiny, powerless to change its raging course. The player serves as a catalyst for change, mysteriously reborn and free from fate's cruel bonds. Their awakening is the pebble in a stagnant pond, sending ripples of change throughout the land. It's a cut above standard fantasy adventure fare. While the central story sets the foundation for a fine action role-playing game, it's the tales told in the game's countless side quests that define the setting, adding color and detail to what otherwise might have been another generic fantasy world. I hesitate to refer to them as optional; these tiny adventures are as essential to enjoying the experience as the main event. 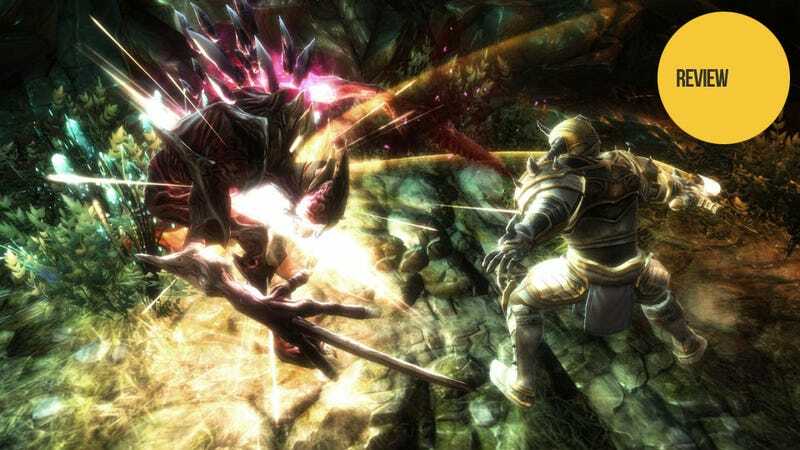 If you don't experience the political intrigue, romantic entanglements, sinister magics, and the odd bit of whimsy lurking in the periphery of Kingdoms of Amalur: Reckoning then you aren't getting the most out of the game. Build Your Own Adventurer: In keeping with the theme of forging your own fate, Reckoning doesn't constrain the player to one single character class. You aren't a mage, rogue, or warrior unless that's what you want to be. Every level the players is given points to put into powers spread across three disciplines: Might, Finesse, and Sorcery. Where points are placed determine which Destinies (classes) are available. Put all of your points into the Finesse tree and you'll unlock progressively more powerful rogue destinies, each conferring new bonuses to your character. Split points evenly and you'll unlock hybrid Destinies. It's a system that gives the player complete freedom to develop their Amalur representative as they see fit, a heady amount of freedom that's thematically sound to boot. The Dance of the Blades: Astoundingly deep and intuitive, Reckoning's combat system allows magic, melee, and ranged attacks to be blended together in an seemingly effortless dance of death. While I'm not normally one to get behind melee combat based on time button presses (just let me mash them! ), Reckoning's system is so finely honed that to tiny plastic circle on the controller felt more like an extension of my sword (or faeblade) arm, rather than an obstacle to overcome on the road to total enemy destruction. With special abilities and magic only a shoulder button away, I was a force to be reckoned with. Dark Arts and Crafts: Forging and naming your own magical weapons and armor, brewing your own potions, and creating powerful enchantments to enhance your equipment; three more reasons why I'll be playing Reckoning long after this review has grown cold. A simple crafting system goes a long, long way. A Distinct Lack of Personality: While Reckoning does an amazing job of investing me in its setting, the characters populating the world failed to leave any sort of lasting impression. Despite having completely immersed myself in the game for the better part of a week, I couldn't name one character in the game without having to look it up first. I'm not certain if it was the unattractive character models, the merely passable voice acting, or the characters simply being overshadowed by the grandeur of the world 38 Studios has created; they simply didn't click with me. What's sad is I can pinpoint the areas where I was supposed to have some sort of emotional reaction. During a tragic / triumphant moment in the middle act of the main storyline I am certain the game wanted me to stand up and cheer, but I couldn't have cared less, and I'm the sort of guy that cries over children's cartoons. I am the movable emotional object, and Reckoning failed to get the job done. A Pattern Emerges: Get quest. Travel to dungeon. Fight boss. Get next quest. While it might not be as readily evident to those playing the game at a more leisurely pace, Reckoning settles into a rhythm after the first dozen or so hours and sticks to it throughout the rest of the game. You'll fight your way to the dungeon entrance to open up the fast travel point, warp back to a city to repair your equipment and stock up on potions, and warp back to get the job done, over and over again. What begins as a grand adventure soon lapses into routine, which lessens the overall impact of the story, especially when it's pointed out to you. Sorry about that. Flawed Designs: Cameras dynamically frame dramatic scenes from behind patches of grass. Lore stones littered about the world tell stories using voiceovers that continue to play during story dialog and monster encounters. Transitions between the game's few cinematic cut scenes and actual gameplay are jarring and often accompanied by strange graphical glitches. These annoying little bugs and questionable design decisions don't break the game, but they certainly detract from the experience. Equipment Degradation: If you don't repair your equipment on a regular basis it will break, and you will probably die unless you've got a backup weapon in your inventory. I've never been a big fan of this sort of mechanic, and it seems particularly arbitrary in Reckoning, serving only to break up the action and remove massive amounts of cash from your character's wallet. As the screenshots and videos of Kingdoms of Amalur: Reckoning slowly began to trickle out, a fear grew in the pit of my stomach. A fear that these great talents were assembled to create to most generic action role-playing game of all time. As it stands they came dangerously close. Had the setting been slightly less fleshed-out, the characters slightly more wooden, you might be reading a very different review. But the dream team came through in the end. The world is vast and varied, conveying a true sense of history through its design and the countless little tales lurking in every shadowed corner. The mechanics are sound and satisfying, marrying the tried and true with the risky and new to create something familiar yet different enough that it doesn't feel stale. Kingdoms of Amalur: Reckoning doesn't come across as the beginning of a new franchise. Thanks to the combined talents of its development team — superstars and regular joes alike — it feels like the latest and greatest entry in a storied series. I can't wait to see what happens next.